East China’s Jiangsu province piloted the establishment of agricultural industrialization consortium to serve as a full-industrial chain linking upstream and downstream so as to stimulate the vitality of various new agricultural management entities and promoted the development of the province's agricultural development. Leafy vegetables are very popular during the spring festival holiday. Situ Fushun, a vegetable grower in Lishui district of Nanjing, used to be vexed about the vegetables he grew as he was not assured of the sales. This year turned out to be an exception. 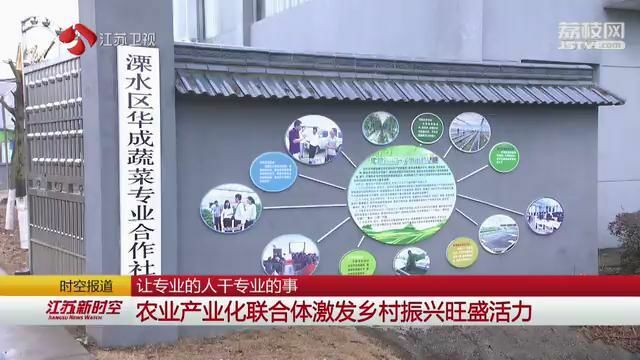 In June last year, under the support of the agricultural department of Lishui District, Nanjing Luchen Agricultural Development Co., Ltd., which mainly sells vegetables, took the initiative to launch a joint agricultural cooperative by enlisting local family farms and some vegetable growers in the first ever agricultural industrialization complex in Nanjing. In this way, agricultural enterprises are responsible for the market, agricultural cooperatives are responsible for the supply of agricultural machineries, technical guidance and other services and family farms and growers are responsible for production. With each performing their duties, the unified arrangement, standard production, transportation and sales not only ensure the quality of crops but raise the prices so as to effectively prevent the blindness of individual farmers' production. At present, there are nearly 100,000 new types of agricultural management entities in the province. However, for a long time, the loose connection between enterprises, cooperatives and farmers has often led to the unstable supply of raw materials for some leading enterprises and the services of farmers' cooperatives as individual farmers were weak in the bargaining power. Last year, Jiangsu piloted the promotion of agricultural industrialization consortium to ensure strong cooperation and division of labor, allowing internal member units to focus more on their own areas of specialization, but also provide seedlings, agricultural materials, and agricultural machineries for the new farmers. Up to now, the province has established a total of 289 agricultural industrialization complexes, which further helped with the establishment of 2,765 new business entities such as cooperatives and family farms. By improving the distribution mechanism of benefits among members, the new management method realizes the sharing of resources such as technology, information and market, promotes the deep integration of agricultural production, and boosts the improvement of agricultural quality and the continuous increase of farmers' income.